Seville and the United States have always been connected. From the times of the discovery of the Americas, when Seville was home to the world’s most important harbor, until today, there are many examples of this historical relationship. 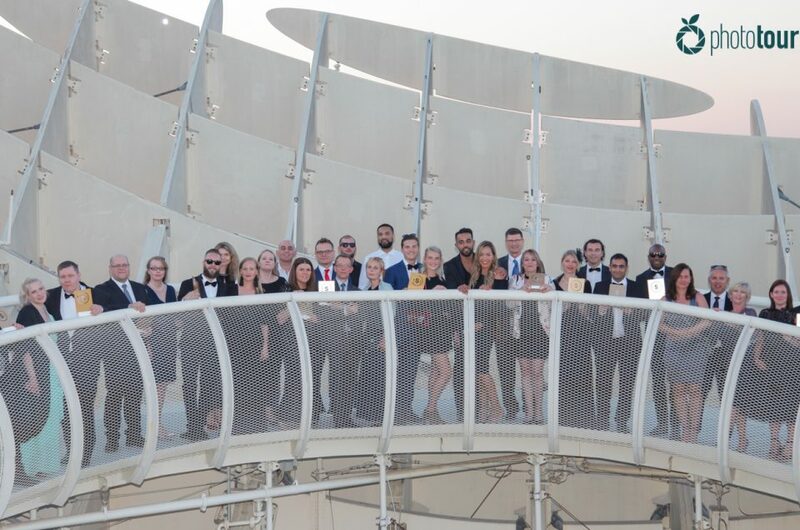 The result is that you can find some interesting connections between Seville and the US all around the city. Historical buildings, houses, wharfs and even entire neighborhoods… all of them are places that are worth a visit. Do you want to know where you can find them? Have a look at these ones, because discovering these spots is also a fun thing to do in Seville if you are here for the summer. In 1929 Seville hosted an Ibero-American Exposition that brought together the participation of different countries. One of them was the United States, and this pavilion was the representation of this country in Seville during that time. It was designed by William Templeton Johnson, a Californian architect known for his Spanish revival buildings. This building used to hold a very important collection of books and maps about US history, as well as some works from the National Museum of Fine Arts, the Smithsonian Institute and others. For some years after the Exposition, the United States Pavilion housed the American Consulate in Seville. Today, it represents the headquarters of the Fundación Valentín de Madariaga. You will find this pavilion next to the Costurero de la Reina, another place in Seville that we recommend that you visit. 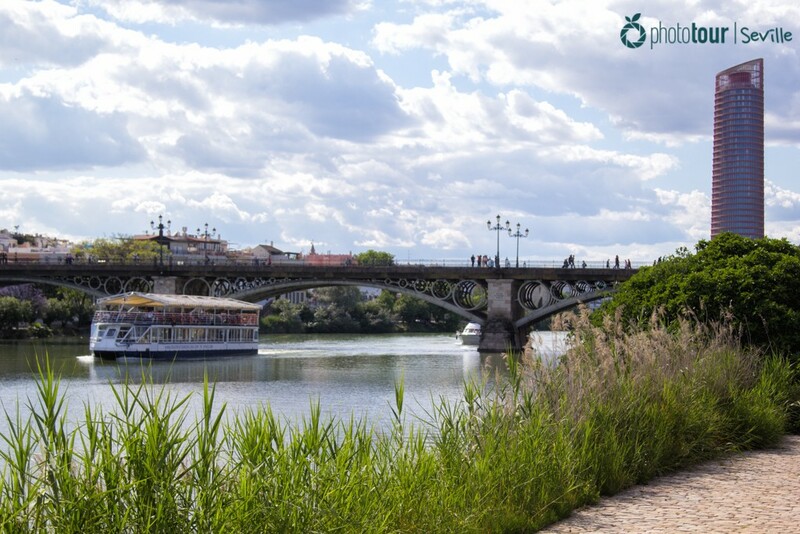 Going for a walk by the Guadalquivir riverside is one of the best things you can do in Seville. But this is a long river that separates the city, so… what’s the best part to visit? We usually recommend going to the area known as “Capote”, because close to that there are some nice activities you can do in Seville with the Guadalquivir as the protagonist. But if you want to visit a place with a direct link to the US, try the Muelle de Nueva York (New York Wharf). This wharf was built in 1905, and it used to be the place where passengers crossing the Atlantic Ocean set off for New York at the beginning of the 20th century. Today it tells you a different story, of course, and it has become a very animated area to visit, where you can find some nice terraces to have a cocktail, a beer or some sangría, and even to dance at night or listen to some live music. Oh, and if you keep walking a little bit and pass below the Puente de los Remedios, you will also get to the Acuario de Sevilla (Seville Aquarium), the Noria de Sevilla (Ferris Wheel) and some pretty good restaurants. So yes… definitely a good area to visit in Seville at any time of the year. 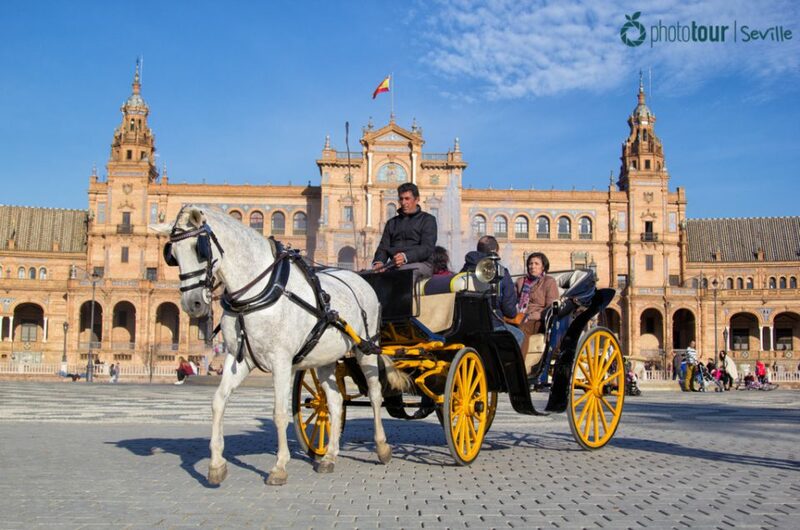 Did you know that Seville hosted a good amount of the US officers from the military base of Morón de la Frontera? That was during the 50s, and in fact they got permission to plan an entire neighborhood the American way. The result was the Garden City of Santa Clara, which is really like a piece of the United States in Seville. This area maintains some good similarities with the typical American suburb, with the combination of parks, condos and big houses with their gardens. Obviously, a lot has changed with the passing of the years, but you can still see some undeniable resemblances, like the old baseball field, today a big public garden. 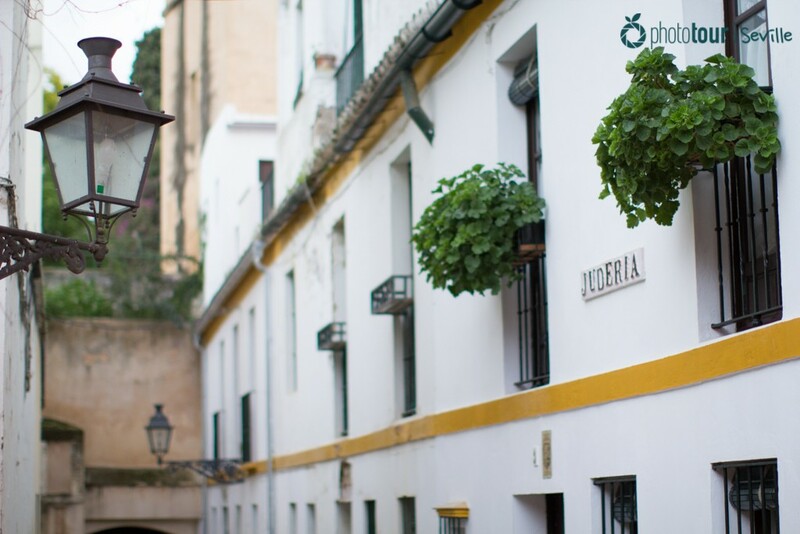 Another thing that keeps its essence is the quiet and relaxing environment, so if you want to take some time to just walk through a nice neighborhood, Santa Clara is definitely a good place to visit in Seville. 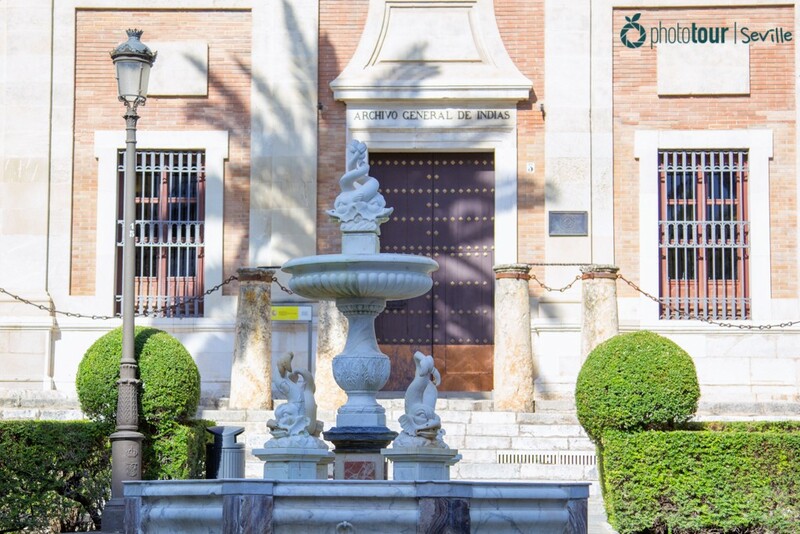 You will find this incredible building, a good example of Spanish Renaissance architecture and a World Heritage Site, next to the Cathedral on the Avenida de la Constitución. Even though it is not as impressive as the Cathedral itself or the Real Alcazar (also very close), this monument is worth a visit if you want to know more about the links between Seville and the United States. The General Archive of the Indies used to be the ancient merchant’s exchange of Seville. Today, instead, it stores a huge collection of historical value documents related to the Spanish Empire’s presence in America and the Philippines. Also, it usually hosts different expositions and collections of great value, so you should pay it a visit if history interests you. You won’t be disappointed! We always recommend that our customers go to Santa Cruz during our photo tours in Seville. This magical neighborhood with its little narrow streets is full of history, and it preserves the essence of another time between those corridors and old, low-rise houses. So it is not hard to understand why the US romantic author Washington Irving chose to stay at this place among others in Seville. Although it is one of those secret places in Seville a lot of people don’t know about, you can find the house he stayed in at Calle del Agua (Water Street), going left right after crossing by Jardines de Murillo (Murillo’s Gardens). There is a plaque on the facade of the house that pays tribute to this American writer, who also served as the US Ambassador to Spain from 1842 to 1846. Even though you can’t visit the house on the inside, you can see from the outside its nice patio, where it is easy to imagine him writing some of his awesome short stories. Did you know of the existence of these places? We bet you didn’t know them all! Now, if you are in Seville or planning to come soon, get your camera ready because all of them are worth photographing.